The market reports continue to be weak this week. 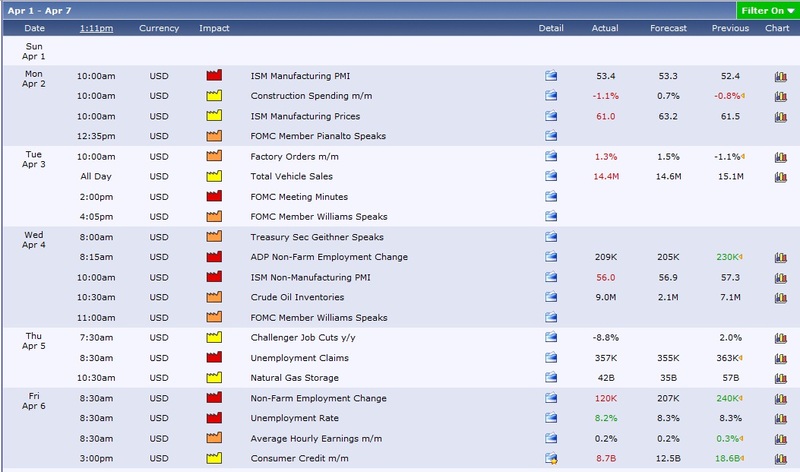 Wednesday Durable Goods Report (which measures how the entreprise will be doing 3 mths down the road), Thursday Jobless Claims (Weekly figure on jobless help package), and Friday GDP figure all falls BELOW expectation. 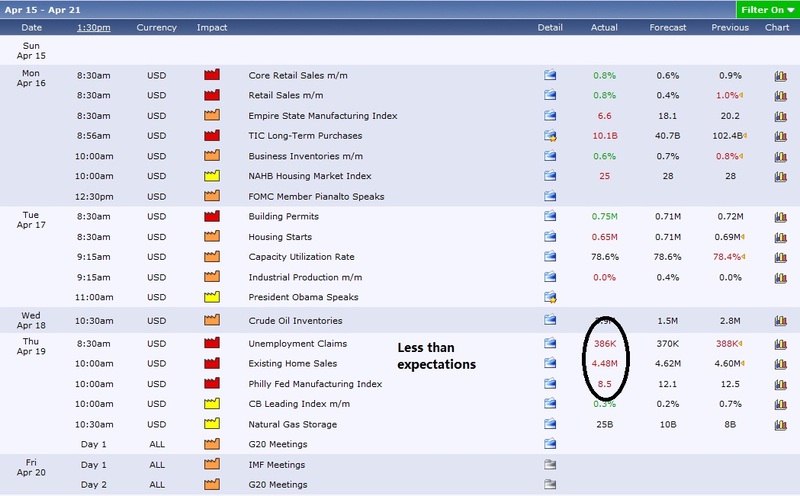 This shows that this month the economical reports are consistently weak. This should have been a month whereby the index tumble. But why haven't it tumble hard?? At the beginning of April, we have mentioned that this is an earnings month. In an earnings month, some of the focus will be shifted to companies earnings. That is the MAIN REASON why the market did not fall hard. If this isn't an earnings month, I am sure every day we will be talking about bad economical report, problems in China and debt problems and political issues in Europe! The last 3 days US Market has been rising. 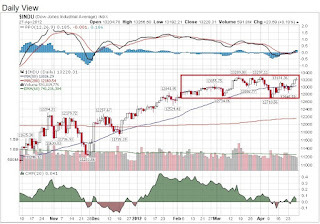 S&P500 has risen from 1360 to 1400, Dow Jones is back near its BOX TOP at 13300 again. Amazing recovery over the last 3 days. All this is because of APPLE. This staggering company is reviving the confidence of the companies earnings report on Wednesday. In fact statistics show that this season, more than 80% of companies issue earnings results above expectations, which is good news. April has not been a good month to trade, a volatile month, a contradicting month whereby companies' earnings are generally good, but not economical report. It is good to stay in the sideline if you are not confident. Wait for next week mega May reports before we make the next move! Famed investor Jim Rogers, co-founder of the Quantum fund with George Soros and chairman of Rogers Holdings and Beeland Interests, joins The News Hub to discuss his outlook for the financial markets, China and the U.S. economy. The week is ending soon. Now I am already studying about next month's market direction. If you know our style,we always like to study how enterprises and public reports are to determine the direction of the month. 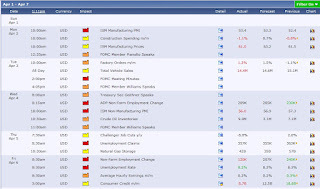 However, I am worrying about next month's employment report, the Non-farm payroll report, which will come out next Friday. After studying the jobless claims this month, I feel that next month's Non-farm payroll may have higher chance of falling below expectations. If you remembered, this month's non-farm payroll is a disaster, leading to the index drop from the peak. In fact a lot of US companies fall from the high after the non-farm payroll. Of course, I do not like to predict results before they come out. But sometimes as a trader, I will assess the probability of whether it will be more or less than expectation before the real result. As such, I will know what the risks are holding on to a stock or buying the stock before the report. As currently I don't feel quite good about next month's employment report, I would certainly want to stay in the sideline on any long position before next Friday unless I end my position before Friday. I hope my concern about the employment report is WRONG this time. Will keep you updated on our market outlook analysis next week!!! Do keep a lookout. Basically no hints of stimulus at this moment yet... confirmation that interest rate increase in 2014. 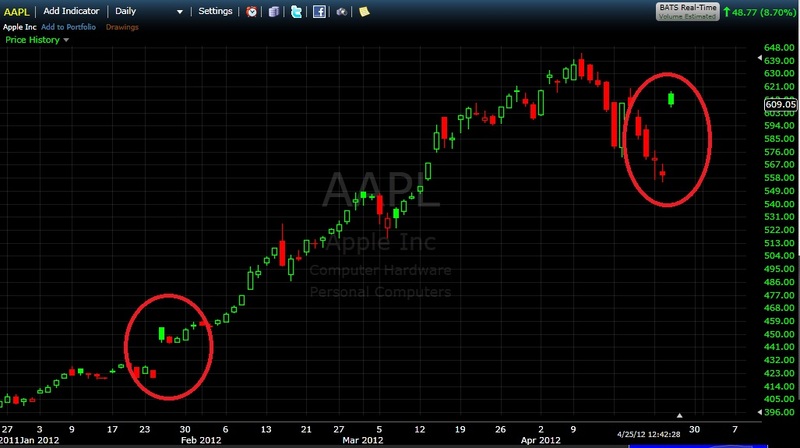 US Stock Tip: Apple is Back in STYLE after this Surprise BEAT! This is what I called, the most powerful GROWTH company in this current modern world! Apple, Inc. reported second quarter earnings of $12.30 per share on revenue of $39.2 billion. 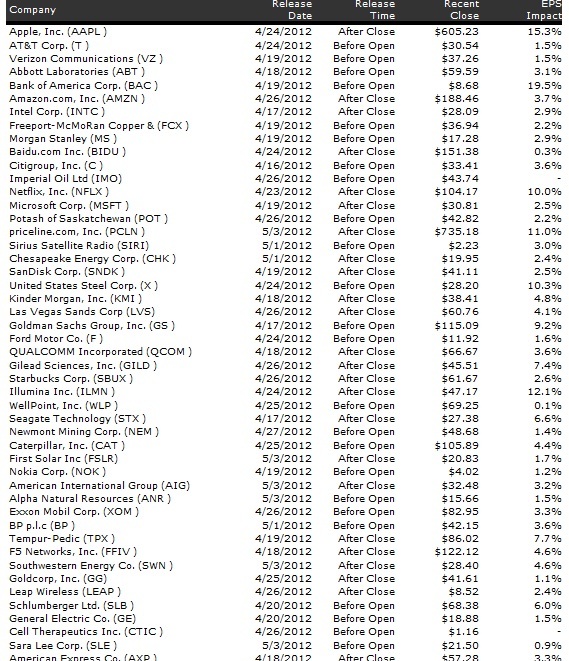 The consensus earnings estimate was $10.03 per share on revenue of $36.8 billion for the quarter ending March 31, 2012. In after market hours, this company gapped up to $40 to above $600. WOW! And to think that iphone 5 is in the pipeline and apple imac sales coming up in next quarter earnings is tremendous. This quarter we have loads of chances to make $ from this maiden again. Having said that, now that it gaps up so much, I have to change my trading strategy. I would have to wait for the consolidation to occur. It may take a few days. Amid the volatile market swing, I find that Starhub seems remarkably strong and resilient. It touches briefly at $3.25 before coming back to end the day at $3.20. Volume is higher today than yesterday, which is a good thing. Let us see if it goes back up to $3.23 again. May have the chance to move up somemore if it can move past $3.23. Having said that, 4th May is the earnings day. Will this stock run to earnings day? Remember to liquidate your position b4 earnings. Affected by the Europe open, Dow Jones dropped 150 points on Midday. 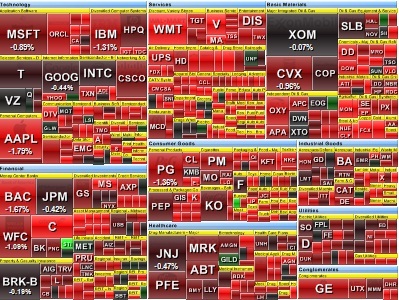 Look at the S&P500 chart of stocks. 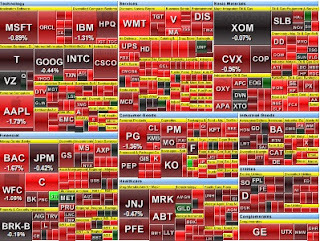 A sea of Red across all sectors and stocks. "NEW YORK (MarketWatch) — U.S. stocks declined sharply Monday as investors worried about political uncertainty in Europe and as Wal-Mart Stores Inc. was hit by a report that it hindered an investigation of bribery allegations." The thing is I feel these are all Bull****! Pardon me for my impulsive language. I just want to get my message across. What Europe uncertainty?! I could not even see a good piece of news talking about Europe uncertainty. This is the nearest article I get touching on any uncertainty, if there is. The thing is, Europe has no political uncertainty. Forget about what Left and Right Wing of French Election. 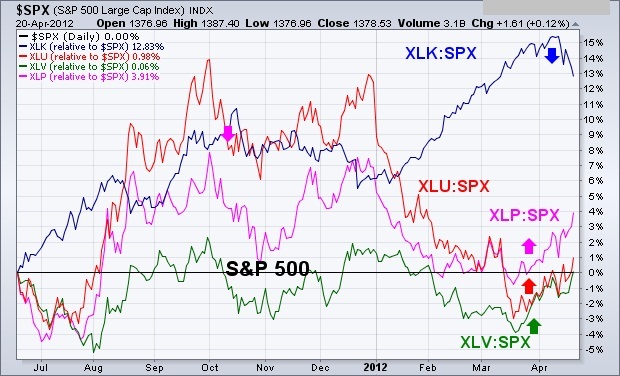 The real reason for this month volatile market is that US Economical Reports aren't good in April. It is not Europe or China that cause this fall. It is just that market confidence is delicate this month ever since the terrible Non Farm Payroll report! And market makers or Big Boys in Wallstreet is making use of news, any news which they can, to SCARE the market, as they knew confidence is not high now. This is the GAME of WALLSTREET! As traders, we need to be sensitive to market psychology and confidence. We need to have methods and ways to track this market confidence. We need an advantage over retailers to know before them the direction of the market! That is why we always make use of our Market Sentiment Indicator to track Market Confidence. It has worked incredibly well. For this month, our advise remains the same: 1) Cut down on your position if you want to enter. 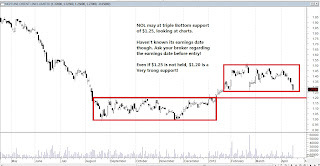 2) Even if buy a good stock, buy a bad one to hedge, a pair hedging technique. Btw, I expect this lack of confidence to continue to next week, until next week's big Employment and Enterprise Data. 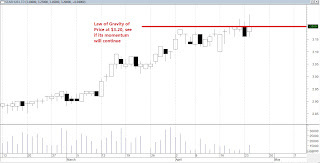 Do not RUSH to enter position, because if next week's reports continue its weakness, it might become a "Sell in May and Go Away" month as mentioned by so many people. 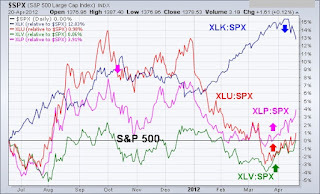 But having said that, if QE3 is out, then it is a totally different story! As I wrote in the weekly article, 2moro is the main event for this week. This week, the market has been totally immersed with Spain's Bonds. DOW rallied 200 points on Tuesday because the sale of 12 - 18 months bonds were better than expected. 2moro will be longer term 10 year bonds which are considered more important!! 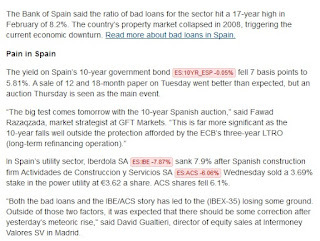 Today DOW drops 80 points again because of Spain because of increasing bad debt ratio by Spanish banks. So I expect 2moro bond auction to be the mega event of the week. If anything is less than expected, expect market to fall and vice versa. The thing is issuing bonds are the only way Government can finance their debts. If nobody buys, then Government will default on payment of old bonds or debts, which may lead to further downgrades on their bonds. When that happens, more don't want to buy them. This is a vicious cycle like what Greece goes through. They are defaulting on their debts. Nobody wants Greece bonds now. Yesterday, it went from day low of $571.91 to $609, an increase of $38 in 1 single day!!!! Remember $570 is a Law of Gravity of Price! If you come for our course, we taught you how to day trade stocks. Yesterday night was a No-brainer money making Day on Apple play! You would have make BIG $ as it went from bottom to end at a high! If you are holding position, continue. Just put your stop loss higher. If you daytrade, I think you make enough. Let us see if the momentum continues today. Chances are high! This can only happen in the US Market. Will we have a QE3? Prof Chan Yan Chong thinks so! Asia’s leading investment guru, Professor Chan Yan Chong recently conducted a seminar on the outlook of the stock market. It was held by Shares Investment at the DBS Auditorium. Professor Chan is a leading expert on how the economy and stock market functions and we have obtained a lot of valuable information on the stock market from him in the seminar. Even the big boys on Wall Street are guessing. In US, the Dow Jones Industrial Average has recently dropped from its high at the start of April from 13,297 to end at 12,921 yesterday. The reason for this drop is that the Fed Chairman Ben Bernanke quashed the possibility of a QE3 in the near term. There has been a small correction in US since his remarks. As US election will happen at the end of November, Professor Chan thinks that the main objective of US this year would be to bring down unemployment rate. This can only be achieved if Americans start to spend and enterprises start to expand their businesses. Professor Chan is of the view that the objective of printing money needs to serve two purposes which are to distribute money to Americans to spend and to distribute to enterprises so that they create jobs. The last round of QE2 did not serve this purpose as the bulk of the money for QE2 went only to the rich instead of everyone. As Americans did not spend, businesses did not improve, enterprises in turn, did not borrow money to expand their businesses. QE2 only benefited the stock market but not in the creation of jobs. To know more about what Professor Chan taught in the seminar, please come for our Free Revision session on Professor Chan’s teachings. Somehow I feel STI is one of the Most resilient Index last week. Hot $ coming in? Just a feeling, haven't done a comprehensive research. Treat this as a leisure article. Last week, US seems quite volatile. However I notice that STI didn't drop. In fact I think it rises. It seems quite strong recently. Today all major Asia index is in the red (though not much), STI manage to stay in the green. Today I read Straits Times article that some Hedge Fund money (known as Hot Money) coming into Asean Region from US and other places. VERY INTERESTING! I haven't studied KL index, see if it is as resilient. But let me do some research first. If this is true, maybe it is time to pick up some Singapore Stocks after a long consolidation. Will STI going to pierce through 3030 soon? If HOT MONEY coming in, this is certainly a BIG possibility! In US, this week is a fully filled earnings week. Starting from Monday, Citigroup will announce its earnings Before Market Open. After JP Morgan and Wells Fargo dismay results, market is looking to Citigroup for a shot in confidence in the Financial Sector. On Tuesday, Goldman Sachs earnings will influence the Financial Sector. IBM and Intel will influence the technological sector while Pharmaceutical companies will look up to Johnson & Johnson. On Wednesday, American Express will influence credit companies like Visa and Mastercard. 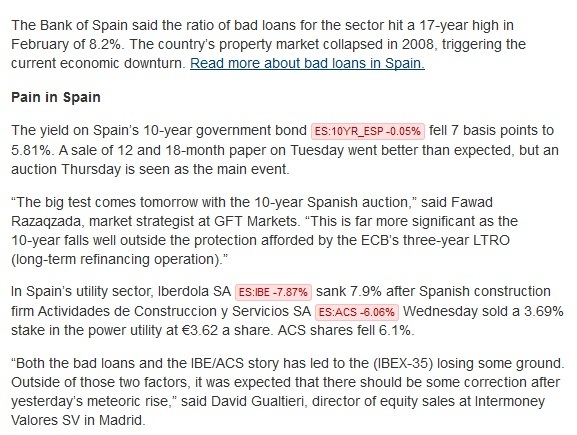 On Thursday, Market will FOCUS on the Spanish Bond Auction, where some analysts forecast might not be that good. Just be careful! So keep double eyes on that auction. On Thursday, Microsoft will also create an influence on Tech sector. So much filled action this week from earnings plays. 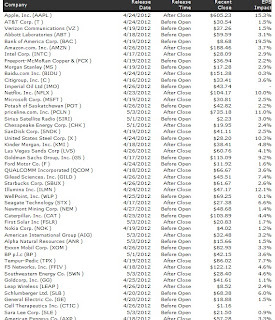 Just keep note of the sectors you play and look at some of the influential companies that might influence your stock! Google indeed Dictate the Market on Friday - in the worst way possible! 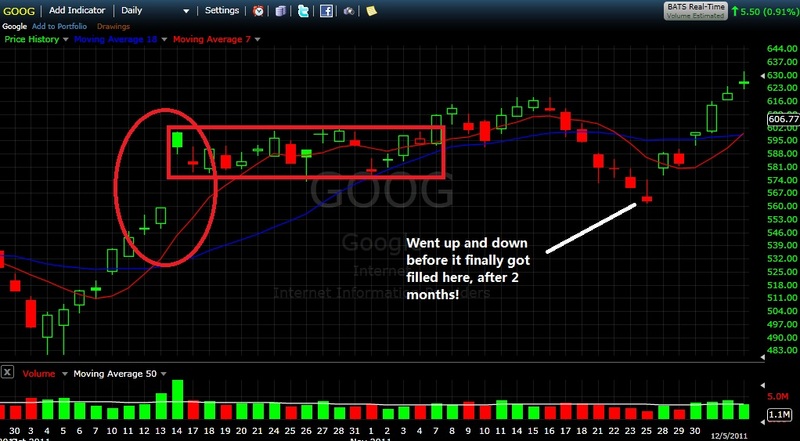 As I have mentioned, Google probably will dictate Friday Market. It contributed in the Dow decreasing by a triple digit 136 points on Friday. 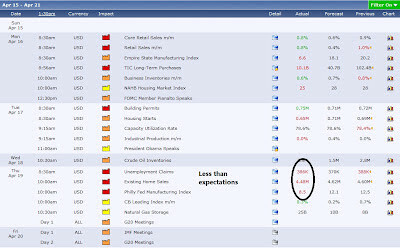 The Fear of China slowdown is back, although the paradox is that Shanghai actually increase for the day. I have time and again mentioned that April might not be that good a month to trade on the upside as ECONOMICAL Reports are not that good. 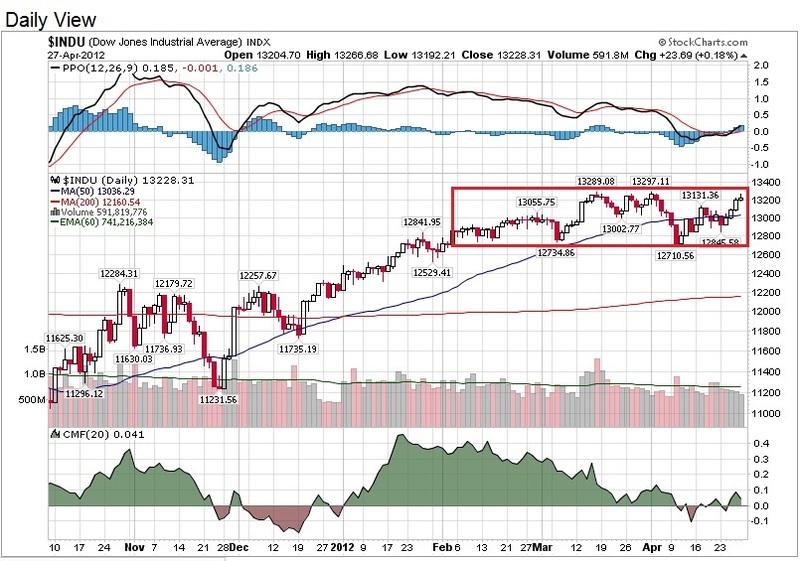 I told in our last article that I am not convinced when Dow increased 200 points on Wed and Thu. Friday proves the point! 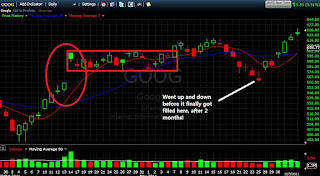 Google after releasing its earnings on Thursday night, went down $26 on Friday. What is amazing is that it actually beats its earnings estimate by $0.51, an upside surprise of 6.19%. However what caused this stock to collapse is that Google reported a 12% year-over-year decline in cost-per-clicks. Btw, Google shows the unpredictability of earnings. Lesson to be learn in Trading! Never hold any stocks through earnings if you are a short term player. Will Google rise back again? YES! This quarter will have opportunities to play it again. Just that it needs a Rest. Every stocks Rest before they run. Apple was also dragged down. It was dragged down because BIG MONEY has left the stock. That is the reason that on Thursday, we issued a statement that Apple has been lying dead, and we don't see any heartbeat. 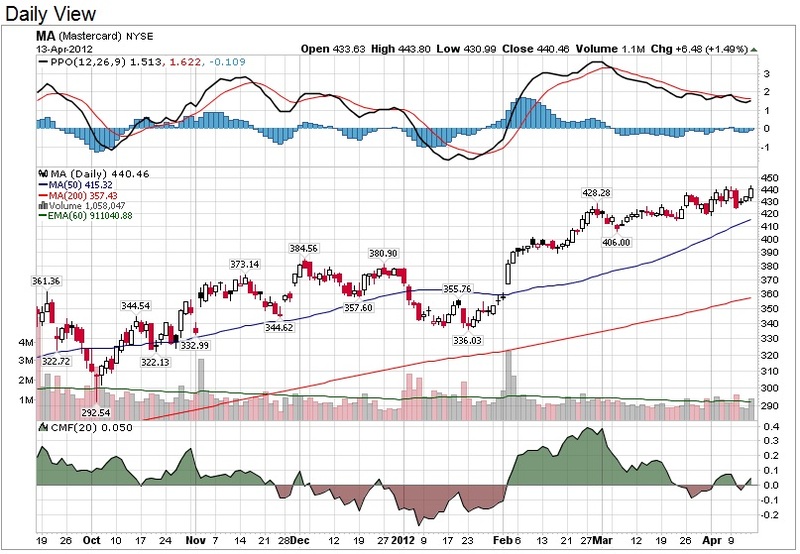 On Friday Apple reached a low of $603. I am using a microscope to scrutinize this stock now. $600 is the STRONG Support, I would pay attention if I see any revival, especially if this stock starts to move more than $10 a single day. Would take a look again if it exceeds $615. But all in all, my advice in trading is that we should always STUDY the market before stocks. As we have mentioned that Market is not that favorable now, just be prudent and careful in our approach. Remember your stop loss this month! There is always another time to make back our Money! Move on if you have lost this week. Take a breather, study the market, plan your trades, get back to basics. THIS IS THE LIFE OF A TRADER! Hi Daniel, what is the next target for Apple? What do you think? 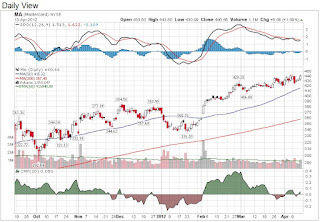 My near term target for Apple is $647, yes, just $10 away. Now the price is $636 at closing. Will it breakthrough? Perhaps, but I would sell at $647 first. It needs to consolidate a while. At least for 1 or 2 days. After it breaks $650, I would go in again. However my STRATEGY for this stock is I would DEFINITELY sell before its earnings day. Now there hasn't been a confirmed date on earnings released date. Probably 24th or 26th April. Apple high chance will be shot down on earnings day. Forget what the PRESS say about this stock. The more hype there is, the more the stock will gap down. 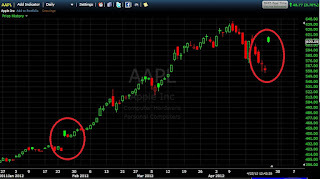 I have seen so many High Growth Stocks being shot down by Wall Street on earnings day and I have lost so much $ during the last few years that I know this time, Apple might not beat the expectations. However, after earnings, it can be time to accumulate this stock again! STI down 25 points and currently trading at 2963. STI support level is 2936. 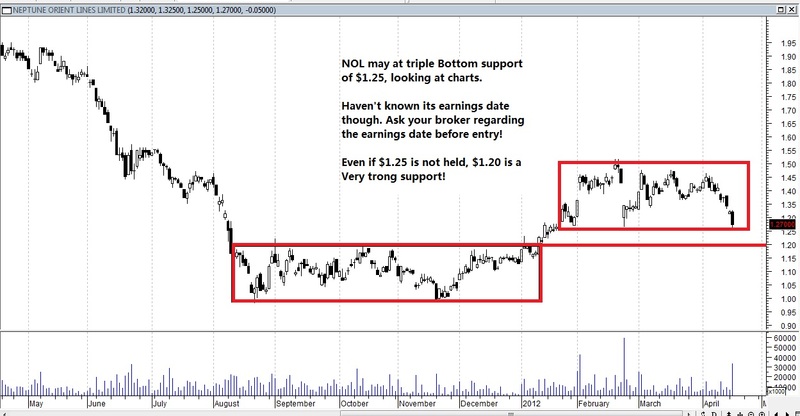 Technical view for Noble: See attached/below chart. 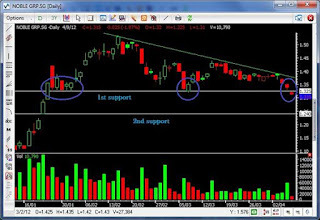 Obviously it has broken below 1st level support and if you look at the chart it has forming a Descending Triangle pattern and this kind of pattern is for short-sell opportunity. Above mentioned is our view and only CFD can be used for short-sell. On 12 Apr 2012, Thursday (English Seminar) or 13 Apr 2012, Friday (Chinese Seminar).